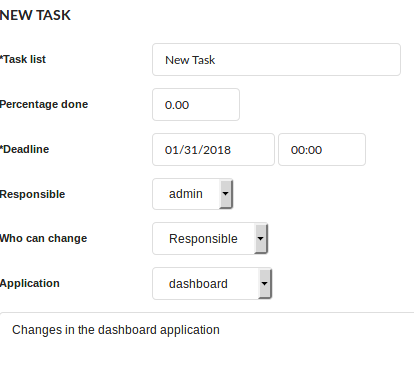 Tool that allows the creation of a list of tasks for the users registered in the same ScriptCase, with a progress control for the task. A message that will always be displayed when the users that possess a task pending login. Accessing it, you will see all the registered tasks with the information about each one of them. The tasks can be created in four levels. Public List - All the ScriptCase users can view the tasks of the this level. My List - Only the Creator and the user responsible for the task can view. Firstly, you need to select where you are going to create the task. Selecting the folder, the “New Task” button will be enabled. Next, after clicking on “New Task”, you need to fill up the required fields. Task list - Name of da tarefa, que será exibido na lista das tarefas. Percentage done - Inform the percentage of the task conclusion. Deadline - Define the date and time that the task need to be concluded. Responsible - Define which of the ScriptCase users are responsible for the task. Owner - Only the user that created the task. Responsible - Only the user responsible for the task. All - All the ScriptCase users can modify the task. This tool is used to inform the status of the task, using colors to symbolize the progress. Open tasks - Tasks recently created within the deadline, are represented in yellow. 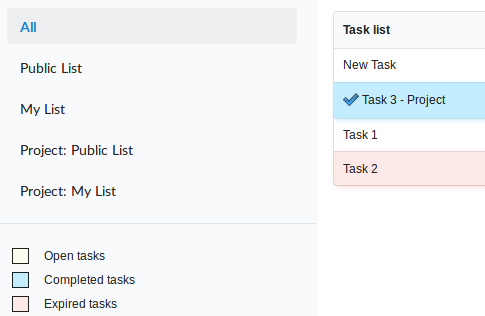 Completed tasks - Tasks that finished completely, are represented in blue. Expired tasks - Tasks that passed the deadline, are represented in red.